We decided to help our clients in the hospitality industry with their service tax queries, and have therefore come up with this elaborate post on the impact of Service Tax on Hotels and Restaurants offering cab service. It is mandatory for all hotels in 3 Star, 4 Star and 5 star category and under Heritage category in India to offer ‘Paid Transport on call facility to their guests’. This has been laid down by the Ministry of Tourism. However, even hotels and restaurants below 3 star category can offer such services, and there are absolutely no restrictions on them. A recent amendment has been made in the Finance Bill, 2016 which states that consideration received towards hiring charge includes cost of fuel and other expenses if any borne by the guests of the hotel. Let us first understand the complex framework of cab facility at hotels. A hotel needs to both charge and pay service tax for offering convenience. The percent amount of ST obviously varies with the different options of offering cab facility. Where a lot of hotels link up with an independent vendor for cabs, some have fleets of their own. 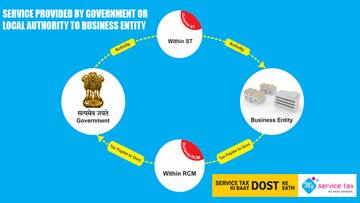 Let us see how these options affect service tax rates under different situations. In situations where the hotel merely makes cab arrangements but the guest pays directly to the vendor, since the hotel is not making money out of the service, it is not liable for paying service tax. Charges for cab transportation is included in the accommodation package. Usually, since hotels do not have cabs of their own, they pay the cab vendor. Section 66-F of Chapter V of the Finance Act, 1994, as amended says that if various services are bundled and offered as one complete package, it shall be considered as provision of single service which gives the bundle its essential character. Here, the principle service is accommodation. Hence, the hotel shall charge the guest on one complete package. The rate of service tax remains the same as that on accommodation. Further, the hotel may be subjected to Service Tax on its expenses made on cab vendor under Reverse Charge Mechanism as specified under Notification No 30/2012-ST dated 20/06/2012. However, if the hotel and vendor are in the same line of business, chances are that the hotel may be declared free from paying service tax. Some hotels do not charge their guests for making cab arrangements. They will book a cab from their reservation counter on request and charge the guest exactly the amount that the cab vendor demands and add it to the final bill. Once the guest has made the payment, they pay the entire cab fare to the vendor and do not keep any amount. Such hotels do not stand any liability to pay Service Tax. They can claim exemption from paying Service Tax subject to the fulfillment of condition laid down under Rule 5(2) of Service Tax (Determination of Value) Rules, 2006 because they are acting as pure agents and only facilitating the process. They may charge the guest (Cab Fares + Service Tax) and pay the same to the vendor. Such hotels tag cab facility as a premium service and charge an additional amount over the cab fare. So, the hotel charges the guest the ‘Accommodation Charges, Cab Fare and an additional value for making cab arrangements’. Such hotels can charge their guests Service Tax on 100% of the total cab charges without availing any abatement. However, if they wish to avail abatement, they will have to charge Service Tax from their guests on only 40% of the cab charges. Additionally, the hotel can also avail Service Tax paid on the input services of the cab vendor. Let’s say the vendor charges Service Tax on 100% of fare, then the hotel can keep 40% of it as credit. However, if the cab vendor charges ST on only 40% value, then the hotel can keep the entire Service Tax as credit. It is the corporate guests’ liability to pay service tax on the cab charges. If a non-corporate hotel bills such a guest on the abated value, it is not obliged to collect service tax. The corporate guest shall pay on his/her own account. However, if the hotel charges ST on non-abated value, then the guest shall pay only 50% of the Service Tax amount. The other half shall be paid by the hotel. We have now learnt the cases where a hotel takes the services of an external source (here 3rd party Cab Vendor). Now, let’s see how service tax impacts hotels owning a fleet of cabs for guest transportation. A hotel may either purchase vehicles wholly or hire them from a third party. That means that the hotel will have a fleet of vehicles readily available in the campus. The implication of Service Tax, again, is different in these two cases. In this case, the hotel can register itself under ‘rent-a-cab’ service and file returns accordingly. The framework is pretty much the same as that of a cab vendor charging the hotel. Here, the hotel can take service charge on 100% value of the cab charges without availing any abatement. In such a case, it can avail an obvious benefit of CENVAT credit of excise duty on capital goods and inputs and Service Tax paid on input services. But if the hotel wants to avail abatement, then it shall charge its guests on only 40% of the cab facility charges. It can keep rest of the 60% as abatement only if it does not avail credit of inputs, capital goods and input services. In such cases, the vendor provides a fleet of car to the hotel and leaves them at the hotel premises. The vendor charges the hotel for the cars on monthly basis, periodically. Again, the hotel has the option to either charge service tax on 100% of the value without availing abatement. Or it can charge its guests service tax on only 40% of the total cab charges if it chooses to avail abatement. It is important to remember that the car vendor also charges rent from the hotel on a periodic basis. If vendor charges rent to the hotel by applying service tax on 100% of the total value, then the hotel can keep 40% of the service tax applied as credit. But if the vendor charges service tax only on 40% of the value, the hotel can take 100% of service tax as credit. In the current scenario, cab vendors charge service tax to the hotel at 40% of the total rent value as specified under Notification No 26/2012-ST, which states that service tax be applied on renting of any motor vehicle that is designed to carry passengers (guests, here), provided that CENVAT credit on inputs, capital goods and input services are used for providing the taxable service has not been taken under the provisions of the CENVAT Credit Rules, 2004. The hotel ends up paying fuel and maintenance charges on cabs at its own disposal and receives no consideration on them. The government is taking steps to include the fair market value of all goods and services provided by the service receiver in the amount charged so it can make use of the advantage of abatement of 60% on the service tax value as we mentioned in the article towards the beginning.